Bearish undertone continued to persist in the Friday’s session as the NIFTY opened negative and remained in the falling channel throughout the session. It ended the day losing 86.30 points or 0.81%. The nervousness was evident on Friday as the political drama shifted to proving majority on the floor on the following day. What is happening in Karnataka is also being viewed as a prelude to what we can expect in the 2019 general election. Life sprouting out of almost non-existent opposition is seen as a factor which can likely instill political uncertainty in the country. This was first seen during Gujarat assembly elections and now became more evident during the Karnataka polls. As we step into Monday’s trade, BJP’s resignation even before the floor test is an event that can have knee-jerk reaction in the Markets. There are high chances that the NIFTY might see a weak opening on Monday. However, this being said, it is also likely that post weaker opening, the NIFTY might spend rest of the session trying to improve and in the process, the 100-DMA levels will be very crucial to watch for as a major support at Close. 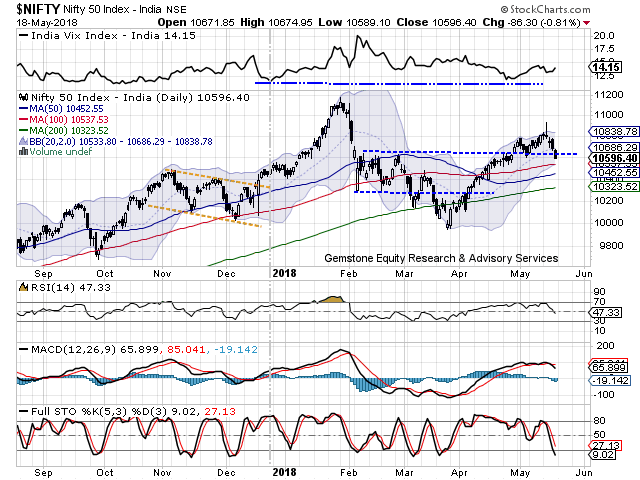 The levels of 10630 and 10665 will act as resistance for the Markets. Supports come in at 10165 and 10540 zones. 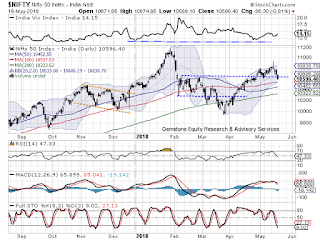 The Relative Strength Index – RSI on the Daily Chart is 47.3261. It has marked a fresh 14-period low and this is bearish. RSI does not show any divergence against the price. The Daily MACD stays bearish while trading below its signal line. No significant formations were seen on Candles. Overall, Monday is likely to turn out to be a volatile day for the Markets. We will continue to see selective buying at any given levels in the sectors that are anyway outperforming the general markets or in the stocks which have posted good results. In event of any possible downside, the 100-DMA levels will be crucial to watch for. Though overall exposures should be kept at modest levels, lower levels can be utilized to make good quality purchases. With political dust nearly settled, Markets may now attempt to find its bottom from lower levels in days to come. Relatively resilient technical setup is observed in stocks like TATA GLOBAL, MANAPPURAM FINANCE, GUJARAT NARMADA, CADILA HEALTH, UJJIVAN, INDIABULLS REAL ESTATE, KARNATAKA BANK, TECH MAHINDRA, TVTODAY and LINDE INDIA.